Trump: My Other Lawyers Fear Being Raided Too - Joe.My.God. Donald Trump has said lawyers acting for him are “deflated and concerned” about the prospect of having their homes and offices raided in the wake of a criminal investigation into his leading attorney, Michael Cohen. 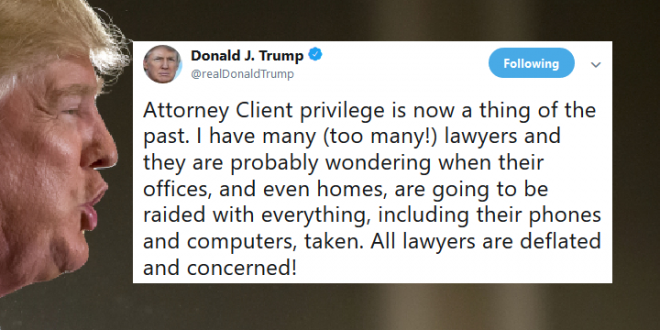 The US president tweeted that “Attorney Client privilege is now a thing of the past” in the wake of the probe into the activities of Mr Cohen, who had his house and office raided by the FBI.